There’s an app for everything, but most violin apps either don’t work as promised or look like they were made in 1820. When we were making Trala, we were struck by how few good tools for violinist were out there. Actually, we're still struck by this. There's some gold out there, though! Modacity is a beautifully designed practice app that helps musicians of all backgrounds practice more effectively. It uses principles of deliberate practice to help any musician of any skill level get the most out of their practice time. For the busy violinist, Modacity can significantly increase your learning rate. Plus, it has beautiful design. The animation of sine waves moving when you record something is hypnotizing. I like Practice+ because it was clearly user-tested and made with thought. Great design, great user experience. It has a bunch of features you'll probably never use, but the ones you do use will be helpful. If you are the type of person who loves to have a big music collection, MusicNotes is the perfect app for you. 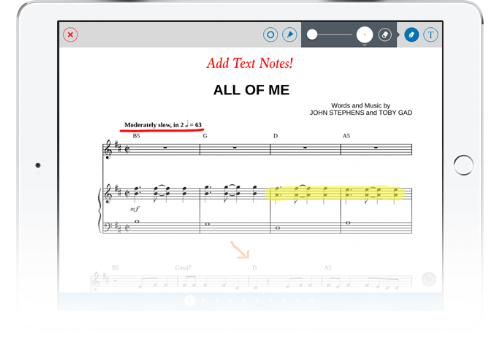 It combines everything you need with digitized sheet music into one seamless experience. You can store, buy, display, and modify digital sheet music. This app is most useful on an iPad. You can buy over 300,000 sheet music arrangements, organize your music, listen to your sheet music with playback, instantly transpose scores, and mark up your sheet music to your heart's delight. The conductor of my university's orchestra first introduced me to MusicNotes and I've loved it ever since. MusicNotes has been around for a while and has a great history of good app design, great songs, and it keeps up with constant updates. It's also pretty responsive to users, a core value at Trala. Notes Teacher is a simple app that allows you to learn to read music notes or to improve your sheet music reading. It has step-by-step lessons in “learn” and “practice” modes that bring you from knowing nothing to understanding the musical staff. Many Trala users want to know how to read sheet music, and Trala teaches you to read sheet music by playing music. If you don’t have a violin yet, this is a great starter, or just a good supplemental tool.